In the past few posts I’ve written about 1911 Commanders from Ruger, Remington and Smith & Wesson; the weight of various carry guns; and some recommended holster choices. Let me bring you up to speed on how some of this has come together as it relates to my day-to-day concealed carry. Take a look at the photo to the right. What you are looking at is a Ruger 1911 Commander with VZ Grips and an ambidextrous thumb safety in an Alien Gear holster. It’s what I’m wearing today as I write this blog post. This has become such a comfortable and functional carry combination for me, I thought you might appreciate knowing how it all came together. I’ve written before about how the Ruger 1911 Commander was the gun that converted me into a 1911 fan. With this gun I know I’ve got the equipment I need for personal and family protection should the need arise. I also wrote a few weeks ago about various holsters I had found that worked well for me in my chosen mode of carry, which is strong side, inside the waistband (what the industry abbreviates as IWB). 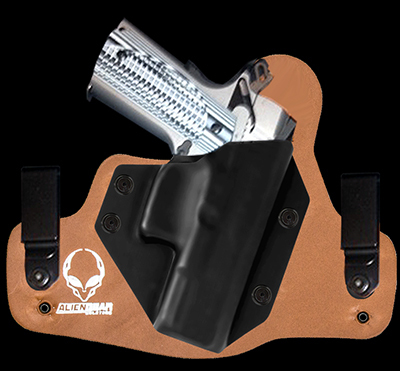 The one shown here is the Alien Gear holster – inexpensive, well-made and comfortable. I put it on and forget I have it on most days. It’s that comfortable. Let me tell you about an experience I had with this company last week. On Wednesday I got an email from them announcing a new “padded” version of their popular IWB holster for only $35.88. I like padded. Competitive holsters cost $65 – $75 without padding. I like to tell my CHL students about good holsters, so I figured I’d order a padded holster from Alien Gear to see what it was like. While I was at it, I decided to order an extra one for my S&W M&P and since the Kydex portion of the holster that is molded to the gun is interchangeable I decided to get just the Kydex for the Springfield XDm that I sometimes carry. I put the two holsters and the extra Kydex in the shopping cart and when starting to check out discovered that the last time I bought a holster from Alien Gear I apparently didn’t create an account on their website. So, I created an account, but when I went to log in, it didn’t recognize me, and it lost all the stuff I’d put in the shopping cart. I got frustrated and quit for the day. The next morning, I tackled it again because I really wanted the holsters and because as a former website/shopping cart developer I wasn’t going to let that get the best of me. I logged in – that worked. I re-created the shopping cart with the items I had selected the previous day. I went to check out, entered my shipping and billing information, followed by the credit card information and submitted the order. Where I expected to see a confirmation page I saw the shopping cart again. I was in a loop. I picked up the phone to call Alien Gear and got a voice mail message telling me all reps were busy, leave a message. I did. Then I went to the Contact Us page on the website and submitted a form telling them what had happened. The next time I checked my email I had an email confirmation. It was for the right amount, but no order detail. It came from Sales@aliengearholsters.com so I replied to it telling them about the problem with the shopping cart. Within an hour I had two separate emails from Alien Gear Holsters – one from sales and one from customer service – apologizing for the problem and asking me for the order detail. Folks they got the order right, they sent me a confirmation and they credited the full price of the order plus shipping – no cost – because of the issues with the website. That’s a company that I’ll not only continue to do business with, I’ll tell others about them. I’ve been telling my CHL classes, the two I’ve had since this happened. I’m proudly wearing my non-padded Alien Gear holster every day and when the padded one comes, I expect I’ll switch and start wearing it. I made two tweaks to the Ruger. I added an ambidextrous thumb safety, not because I’m left-handed, but because having a safety on the right side of the gun makes it very easy to check it from time to time, just to make sure my twisting and turning as I get in and out of chairs and vehicles hasn’t caused the safety to be pushed off due to contact with my excessively-sized torso. Changing out the safety wasn’t a simple “drop-in” procedure. It required some filing and grinding with my Dremel tool. It wasn’t hard, but it took a bit of study. I ordered the safety from Wilson Combat and I found they had a YouTube video describing how to change it out. The guy that did the video assumed a lot and didn’t show a lot of detail, so it was at first intimidating to me, and in fact I gave up on my first try. But, I came back to it later, took my time with the fitting and now I’m very satisfied with the results. I liked the Ruger’s stock grips, but they weren’t notched for the ambidextrous safety. If you have a 1911 and you haven’t done this, go to Amazon.com and search for 1911 grips. Heck, it doesn’t have to be a 1911. Try it for any gun that has interchangeable grips. There are pages and page of grips for the 1911. The ones that strike me the most are from CZ grips and they’re very in-expensive. Most go for somewhere around $30. I have a set of CZ grips on my Remington R1 Carry Commander and now a different set on my Ruger Commander. If you’re ordering grips, it might be a good idea to also order some grip screws and a set of the grip screw bushings. That way if you get a set that doesn’t come off the way it should or if you accidently cross-thread a screw or bushing, you’ll have extras. Amazon has an amazing inventory of gun-related and concealed carry items, along with a truly amazing delivery schedule. Last week I ordered something for one of my guns and a water-testing kit – two totally unrelated items. I placed the order on Thursday night around 7:30 p.m. Both items were delivered to my house early Friday afternoon. I don’t know how they do it. The shipping label said the package came from Las Vegas, NV. I live near Fort Worth, Texas. Did they really fly that stuff on a jet plane to get it to me the next day? I’m an Amazon Prime member. You know what that means? Shipping was FREE!